Godâ€™s predestination and sovereignty were made apparent to me again this week-end at the Philippi Races. The May 31st-June 3rd reenactment of the first land battle of the civil war. I had been asked to guard Maj. General Thomas J. â€œStonewallâ€ Jackson, who is famously known as a Calvinist. 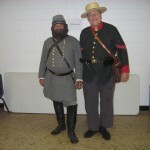 Mr. Riley is a presenter supported by the WV Humanities Councilâ€™s â€œHistory Aliveâ€ Programs and Grants. He may be reached at deriley1@frontier.com, or 304-568-2067. 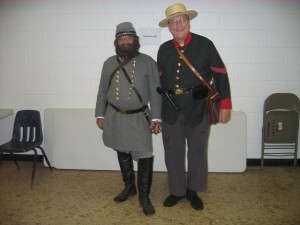 General Jackson, who is portrayed by Doug Riley from Tunnelton, WV, sounded like Charles Haddon Spurgeon as he spoke and preached to over 800 school children during Kidâ€™s day at the basement of the City Building. 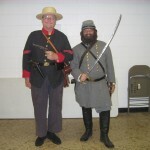 The first person portrayal of General Jackson began at 9:30 and lasted until 1:30, on June 1, 2012. General Jackson turned the basement of the city building into a battlefield, as he laid out the battle of Harperâ€™s Ferry on the basement floor. His presentation lasted over an hour, but he kept the attention of the children by enlisting them into theÂ Confederate army and had them to reenact the battle. General Jackson gave praise to â€œThe Almightyâ€ as he recounted story after story of Godâ€™s providence in keeping him safe while under fire. General Jackson once told an aid that he was as safe on the battlefield as he was in his own bed because he was not going to die until God willed it so. Then he praised Godâ€™s grace by showing how God had predestined him to be shot by friendly fire which eventually led to his death, in his own bed. Following the presentation I spoke with Doug Riley about his portrayal thanking him for his focus on Godâ€™s predestination. Then Mr. Riley further strengthened the truth of Godâ€™s predestination by advising me that he attends Grace Chapel in Kingwood, WV. where Mike Argobrite is the pastor. Pastor Argobrite is a close friend of mine and I then realized that Doug Riley and I had met at Grace Chapel in Kingwood before in 2010 and there again in 2011, following the Rowlesburg WW2 living history. Following this, my wife informed me that another Calvinist pastor, Wade McGee, of Grace Fellowship, at another Reformed Church we have attended in Philippi, and his family had attended one of the sessions, but I had not noticed them. We later ran across them on the Court House lawn and had a pleasant time recounting the dayâ€™s events. At Sundayâ€™s 1800 style church service at Philippi Presbyterian Church, Dr. Danny Franke, preached a Gospel sermon from Psalm 46 (Martin Lutherâ€™s favorite Psalm), and Romans 8, and Matthew 5, in which he exposited the Grace and Sovereignty of Godâ€™ grace and predestination, which blessed this old Calvinist. To sum up, this week-end was for me, and Linda, more like a Calvinist Revival than a reenactment, even though I did spend a considerable amount of my time in marchinâ€™, greetinâ€™, sittinâ€™ and lookin’ pretty, singinâ€™ and shootinâ€.